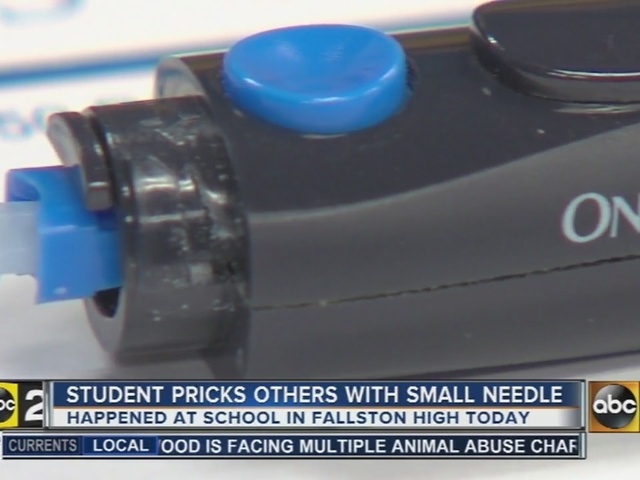 A 15-year-old male student at Fallston High School in Maryland pricked at least 17 of his classmates with a medical needle used by diabetics to test blood sugar, according to the Harford County Sheriff's Office. 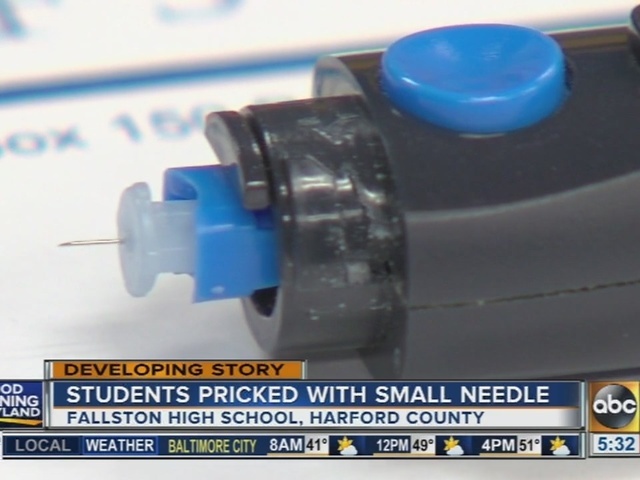 Harford County Public Schools said the student brought a blood lancet to school and stuck other students with it. Sheriff's Department investigators said the lancet was taken from a family member and had never previously been used. An official with the department said the motivation for the incident was that the suspect "thought it was humorous." The incident happened between 7:30 and 10:40 a.m. local time on Thursday. Students went to the school nurse, who advised them to see their doctors. Though parents were eventually informed in a robo-call, a parent of a sophomore, who declined to be identified, said he found out his son was one of the affected students and took him to Johns Hopkins for evaluation. "They said they're not going to be able to determine anything for 3-6 months," the parent said. The school district is investigating while a separate criminal investigation is being conducted by the sheriff's office. The student has not been charged. **Editor's Note: The Harford County Sheriff's Office said at least 17 students were pricked. Harford County Public Schools released a statement that said they were "aware of approximately 20 students."